"Santa Paws" is a wonderful project to raise money for the Society for the Prevention of Cruelty to Animals. I was privileged to take part this year as a photographer. This year, the Santa Paws project added an afternoon of portraits Dec. 15 at Falls Pointe Animal Hospital. Dr. Jared A. Conley was a terrific Santa Claus, posing with dozens of families and their pets. Each customer received a set of prints and a disk of image files. The best part of all was that 100% of the proceeds went directly to the Wake County SPCA. 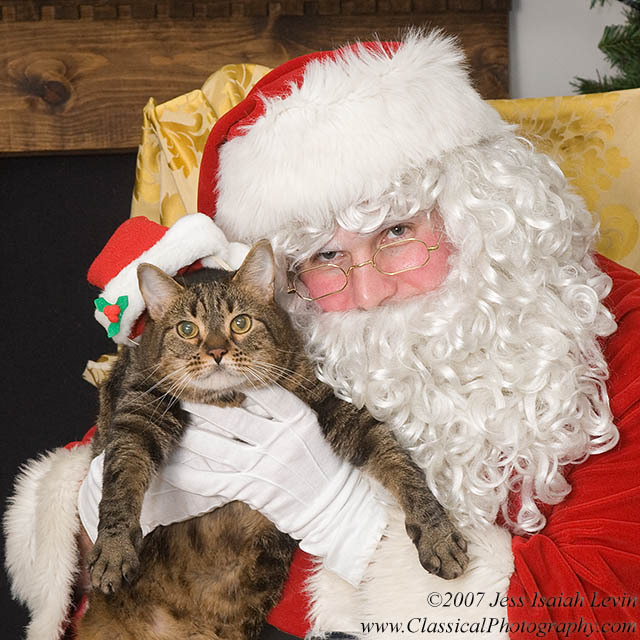 Here is a portrait of "Santa" Conley with Jake, the hospital cat.